Date Nov. 27, 1906. There are 2 bellows supports on either side of the main body which have fallen off the bellows. They do not seem to affect the bellows. The front lens board has adjustable rise and fall only. To make them pull out easier, but I can get them out. All in all with all it's stuff it is a great display piece. It would look great in a window display. I hate to part with it but I am downsizing. 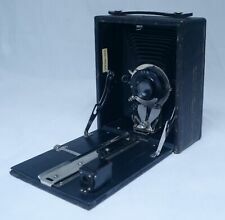 Vintage Folding Camera R. F. Seneca No. 3 A by Seneca Camera Mfg. Co.
R. F. Seneca No. 3 A. 3 1/4" x 5 1/2" exposures on roll film. Normal signs of wear. Sold AS IS. With extention and support brackets (rare). 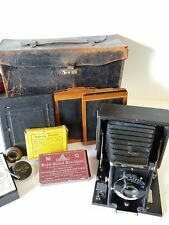 Antiques Seneca Trio Camera With Free Bonus. Untested. For Display Only. For Display Only. UNTESTED, FOR DISPLAY PURPOSE ONLY, BECAUSE I AM SURE NOBODY WILL REPAIR THEM. YOU BUY WHAT YOU SEE FOR DISPLAY ONLY. IN USED CONDITION FOR USERS ONLY. IF YOU ARE "COLLECTOR" OR. Antique Seneca Camera Mfg. Co. No. 2 - FOLDING SCOUT Camera Rochester, N. Y.
Folding Pocket Seneca No. 1A. Shutter speeds work. Wollensak Anastigmat F7.5 clean. Bellows not the best but appears to be typical of the make. Read the history on Wikipedia. SENECA VEST POCKET, WITH WORN BOX, EMPTY 127 SPOOL AND INSTRUCTION BOOK, WORKING EXCEPT LINKS ONLY VERY WEAKLY HOLD LENS BOARD IN PLACE WHEN EXTENDED, LOOKS EX. We want you to be happy. You are buying from a professional photographic dealer. This dates from Oct 1906 to Feb 1918. Get images that. make Supersized seem small. Wollensak SENECA UNO T1B Patented May 11, 1911 & July 30, 1911. It has not been tested. See photos for item condition. The lens is detached from the rail. May have other issues but all in all they seem like easy fixes.